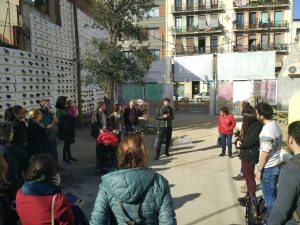 The second Ground Truth 2.0 Citizen Observatory, out of six foreseen in the project, was launched in Barcelona, Spain, on Sunday November 19th. RitmeNatura.cat was presented to the public within the frame of a BioBlitz, organized by the CCCB (Center of Contemporary Culture of Barcelona) as part of the exhibition After the end of the world side events. A BioBlitz is a participatory citizen science event that aims to record as many species as possible at a certain place and time. 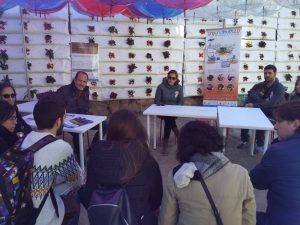 In addition to generating data for biodiversity study and scientific research, a BioBlitz raises citizen awareness of ecosystems and fosters mutual learning. 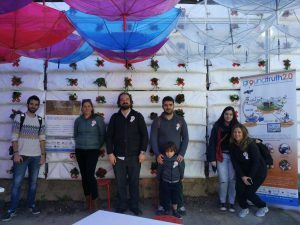 The BioBlitz was carried out on the space occupied by SuperIlla in Barcelona (Poblenou neighbourhood) and the surrounding area, with the objective of capturing the degree of biodiversity that this urban space presents. Two local projects were involved in the development of the BioBlitz. 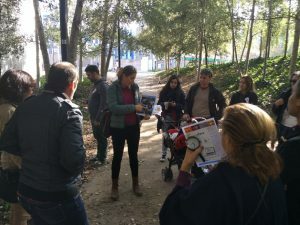 On the one hand, the Ground Truth 2.0 Citizen Observatory RitmeNatura.cat showed citizens how they can follow the rhythm of nature and helped scientists gather phenological observations of the existing urban species in the neighbourhood. On the other hand, the Science in Society Foundation proposed to look for lichens in the same space. The event started at 11.00h in the morning with an introduction of the two projects by their respective promoters the public. After that, all participants walked to the SuperIlla, the designated zone for running the BioBlitz. SuperIlles are configured in Barcelona as urban units constituted by the sum of several city blocks where streets are calmed down to recover public space for pedestrians, internal motor traffic is redirected to the perimeter and priority is given to sustainable mobility and shared, green and safe space. For one and a half hours, streets and green spaces in this neighbourhood were checked by the BioBlitz participants to observe the seasonal status in the life cycle of the species present. Some bushy species and several holm oaks and plane trees were observed and registered. It was a productive morning for RitmeNatura.cat, since both more observations were collected and more participants in the observatory were recruited! The event concluded with a round table discussion with all participants, discussing the importance of citizens and their observations for monitoring the impact of climate change on local areas. RitmeNatura.cat is the name of the Spanish Citizen Observatory developed within Ground Truth 2.0. It aims at seeking nature-loving citizens who want to learn to make phenological observations and help scientists study the impacts of climate change on plants and animals. Phenology studies the seasonal key changes in plants and animals, such as flowering, the appearance of insects or the migration of birds. The moment and duration of the particular phenological states vary depending on the year and the weather situation. For this reason, phenophases of sensitive species can be related to the variations of climatic and environmental conditions. Its study cannot be practically done by automatic sensors and has to rely on the periodic observation of the environment. Experts and volunteers take note of the dates in which changes occur in the biological cycles of the species. The format of the RitmeNatura.cat launch event will be repeated several times during the spring season, with the added participation of schools to get students involved in the observatory.